Considered one of the great American plays of the twentieth century, Inherit The Wind takes its origins from the real-life 1925 Scopes “Monkey" Trial, in which a Tennessee teacher, John T. Scopes, was indicted for teaching that man evolved from apes, instead of state-mandated Creationism. The trial drew national attention and engaged the most famous attorneys of the time, William Jennings Bryan and Clarence Darrow. In creating the 1955 play, authors Jerome Lawrence and Robert Edwin Lee, focused as much on the dangers of McCarthyism as to the debate over evolution, and escalated the politics of science and religion., with intellectual freedom becoming the true issue at stake. In Inherit The Wind, high school biology teacher Bertram Cates (Cullen Delmore, of Wind Gap) is arrested for teaching his students about Charles Darwin’s evolutionary theories. Fundamentalist icon and three time presidential candidate, Matthew Harrison Brady (Dean Tshudy, of Belvidere) volunteers to prosecute Cates in what became known as the “trial of the century.” Meanwhile, the famous “agnostic” trial attorney, Henry Drummond (Craig Evans, of Blairstown), has arrived in town to defend Cates in this high profile case. As these two bigger- than-life lawyers grapple with issues that, even today, splinter the continental divide, the scene becomes set for an explosive episode in the American experience. Other characters in the drama are: Reverend Jeremiah Brown (Dan Mazelis, of Phillipsburg), the spiritual leader of the town; Rachel Brown (Danielle Martinez, of Belvidere) the reverend’s daughter and fiancé of the accused, Bertram Cates; E.K Hornbeck (Bill Nutt, of Hackettstown) the Baltimore Sun reporter, providing cryptic commentary and plenty of pot-stirring. 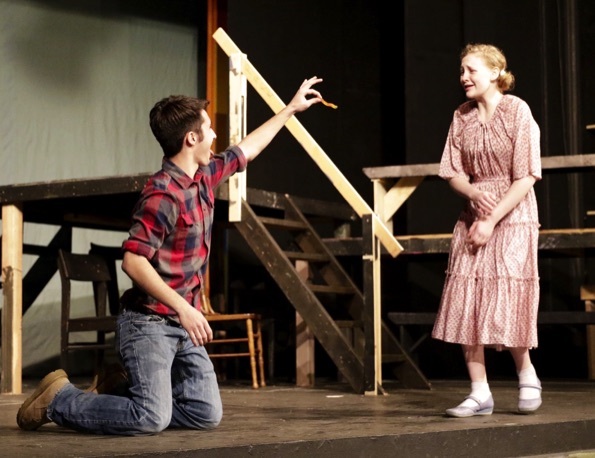 The audience is guided through the play by troubadours Jason Thompson of Belvidere and Skylar Patricia, of Phillipsburg. 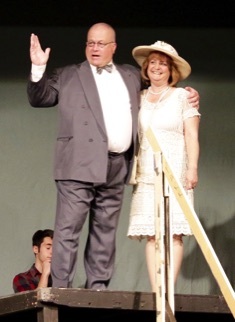 Other principal actors include: Frank Delmore, of Wind Gap; Jennifer Drevitch and Allan Johnson of Washington; Patrick Farley, of Belvidere; Cindi Halkola; of Hampton, Roy Bjellquist, of Phillipsburg, and Steve Mazza, of Stroudsburg. 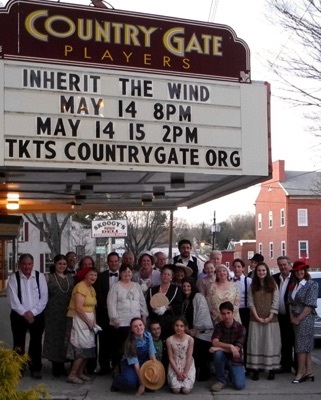 The cast of Inherit The Wind, is enhanced by a versatile and enthusiastic ensemble of townspeople. Members include: Grace Moore-Mattis, of Bethlehem; Colleen Capponi and Hugh Halsey, of East Stroudsburg; Christine and Kayla Ryan, of Easton; Dinah Rush, of Harmony; Emily Niemeyer, of Milford; Jenny Mount, of Oxford; Cailla Minerowicz, of Washington; Ellie Napolitano, of White Township, Alexandra Romeo, of Bangor; Peggy Winters, of Wind Gap and Mike Bellfy, of Lopatcong. 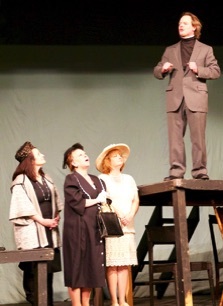 Inherit The Wind is directed by Bill Scurato, of Harmony. 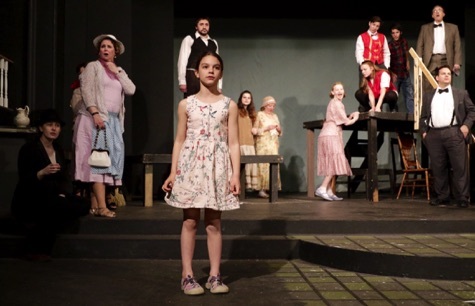 Further information is available on the theatre’s website and on its Facebook page. 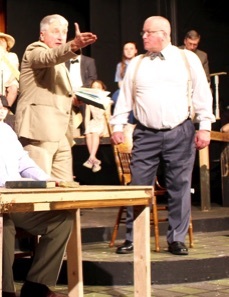 Here's our trailer for Inherit The Wind. Thanks Vinny Foti for the help.